PERTHSHIRE PAINTINGS UK - "What's Happening on the Mill Race?" "What's Happening on the Mill Race?" What's happening on the Mill Race? 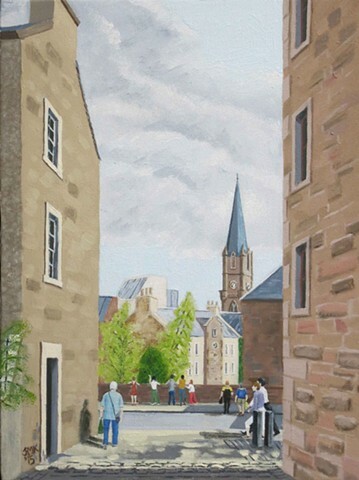 In the background of this painting is St Paul's Church South Methven St, the second oldest church in Perth dating from 1807. In the mid-ground is Hal o' Wynd's House made famous in Sir Walter Scott's book The Fair Maid of Perth. The people are looking over the wall at what used to be the mill race which powered many mills in Perth over the centuries. I follow the lade into town along the footpath and this is the view that I see every time I arrive on West Mill St.